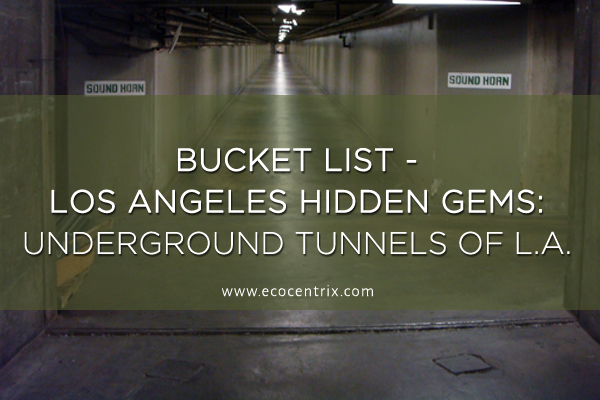 Bucket List – Los Angeles Hidden Gems: Underground Tunnels of L.A. This post is part of my “Bucket List” series of Hidden Gems in L.A. Follow along as I explore and share some of my favorite sources of inspiration around our county. See the entire series here. In this series, I talk a lot about architectural gems that are often hiding in plain sight. Unnoticed by the average person, they become glaringly obvious to architects and other professionals in the industry. But this time, I’m not going to be talking about a gem that you can see on your day-to-day. We’re going deeper. Way deeper. Underground, as a matter of fact! 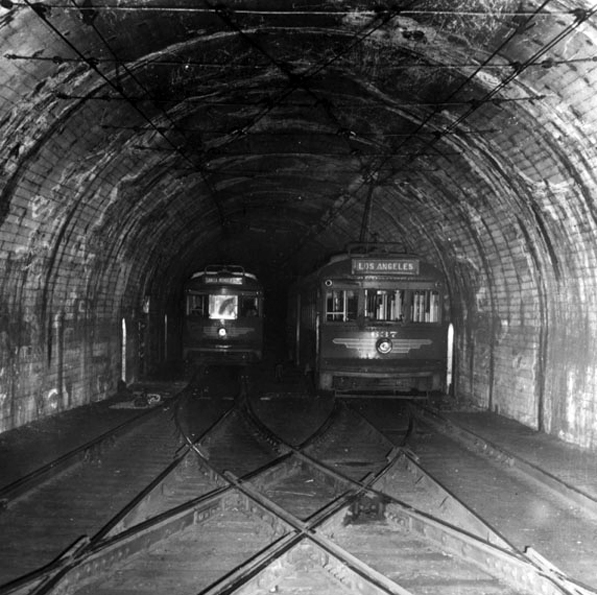 An incredible fact about Los Angeles is that there are literally miles of rarely used tunnels running underneath our city. Many of these tunnels are very well maintained, well lit, and are technically accessible to most people (Hint: check out the old elevators at the Grand Park that say, “222 N. Hill Street”). 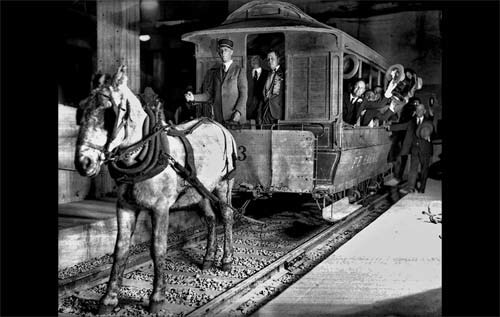 Photo: Nov. 30, 1925: An old horse-drawn car makes a trip during grand opening ceremonies for the higher-tech Pacific Electric subway, the city’s first subway, which stretched a mile between 1st Street and Glendale Boulevard and Hill Street between 4th and 5th streets. This photo was published in the Dec. 1, 1925, Los Angeles Times. The service tunnels aren’t the only tunnels that run under LA. Before cars became the transportation method of choice for Los Angeles, the Red Cars trolleys were king. 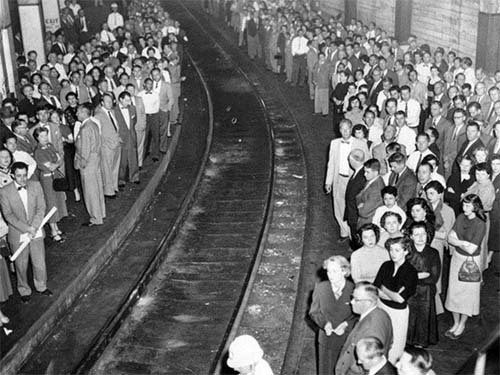 From the 1920s to the 1950s, miles of subway tunnels under LA were used by them on a daily basis. Once the Red Cars closed up shop, so too did these subway tunnels, but they weren’t destroyed or filled in. They were simply closed. And believe it or not, they are still there. Today, these subway tunnels can be quite dangerous, as they haven’t received any maintenance in over half a century. Access is cut off for most citizens, meaning that the chances you will be able to see the abandoned tunnels and subway stations of LA is slim. The existence of the LA underground passages has always appealed to me on a childlike level. The idea that there is an entire sprawling network of hidden passages just under ground level inspires the imagination! Looking back on the days of speakeasies and cloak and dagger bootlegging, well, it just sounds like a heck of an adventure. Thankfully, we can still get a taste of that adventure by visiting some of the locations where the hootch ran freely, unconcerned by the laws above. If you’d like to join us for a drink at the Townhouse in Venice basement, a very popular speakeasy of the time, please just register here! I’d love to get the chance to talk to you about all of the other hidden gems that LA has to offer!